Great place to stay close to everything you need. Neighbours above us were extremely noisy. The chairs in the lounge area were very uncomfortable and the shower had hair in it still. Otherwise my family and I had a great time. Exceptional The accomodation was so good that we extended our stay. Thanks to Stephen (Manager) who made it possible. Breakaway Lovely location, quite, affordable very friendly staff. 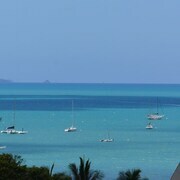 Fantastic location Seems remote yet was so close the main street of Airlie Beach. Great Ocean View Room Checked in late, but the front office desk were very kind. Room was good size as was bathroom. Only downsize was the bed was very hard. 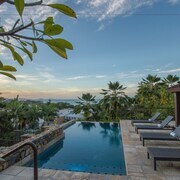 Need a place to crash in Airlie Beach? Whether you're planning on a loved-up escape with bae, a break with your BFF or riding solo (cos why not! ), you'll find tonnes of insanely good hotel deals on lastminute.com.au. Forget about staying anywhere else but in the thick of the action. There are 47 hotels within 2 kilometres of the city centre just waiting for you to snap up. 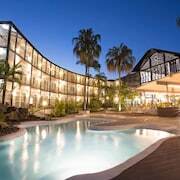 The Peninsula Airlie Beach and the Island Gateway Holiday Park are a couple of the most central places to stay in Airlie Beach. We wouldn't be doing our job properly if we didn't also mention the Mantra Boathouse Apartments and the Peppers Airlie Beach. You'll discover the neighbourhood of Jubilee Pocket only 2 kilometres from the town's centre. It has 4 available hotels, including the Best Western Mango House Resort and Kipara Tropical Rainforest Retreat. Also take a squiz at Cannonvale, about 3 kilometres away from the centre. It has 2 available options, such as the Mantra Club Croc and Bush Village Budget Cabins. 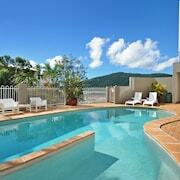 Take in the beautiful natural ambience of Airlie Beach Lagoon. Need a room for the night close by? No worries, we've got your back. 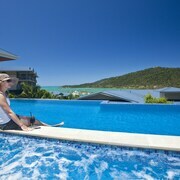 at Marina Shores and at Waterfront Whitsunday Retreat are pretty much around the corner! Get in touch with nature and take a walk around the marshes of Proserpine River wetlands. You can visit it whenever you like, especially if you're crashing at the Toscana Village Resort and at Water's Edge Resort. There's no need to spend loads on posh hotels when there are plenty of options that won't blow holes in the budget. 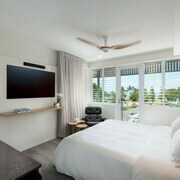 Some of the handiest options are Nomads Airlie Beach and Base Airlie Beach Resort. Seabreeze Tourist Park and Magnums Airlie Beach - Hostel are two other cheaper accommodations worth checking out. You may also like to stay at the Beach Club, which can be found 25 kilometres away. 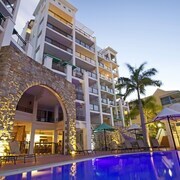 Or maybe the Reef View Hotel, just a distance of 25 kilometres from Airlie Beach. Further alternatives include the Palm Bungalows, 25 kilometres away, and the Whitsunday Apartments, 25 kilometres away. If you want to squeeze more out of your holiday, get out into the wider Whitsundays region and explore some of its amazing beaches and rainforest. There’s no shortage of awesome activities to enjoy here either, such as hiking and shore fishing. Or just get out your map, point to a place and see where your feet take you! 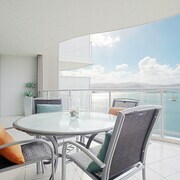 If you want to stay near the airport when you arrive, see if you can reserve a bed for the night at the Hamilton Island Holiday Homes or the Pinnacle Apartments Hamilton Island. And if you can't be bothered looking it up, Great Barrier Reef Airport is located 25 kilometres from the centre of Airlie Beach.